Robert Anson Heinlein was the Grandmaster of Science-Fiction, originator or populariser of many of the science-fiction tropes we take for granted today. Heinlein laid the groundwork for countless authors to follow, combining his engineering knowledge and experience with a knowledge of humanity to open vast vistas for his readers. His popularity remains undiminished, even three decades after his death. Heinlein remains one of the greatest science-fiction writers in history. But is Heinlein still relevant today? He could be – and still is, even by the standards of our time – very controversial. In his later years, he pushed the limits as far as he could. His characters were freethinkers to a degree even we find alarming, discarding the chains of their societies in a manner that could be both heroic and dangerously unwise. His books – and Heinlein himself – have been accused of being fascist, or sexist, or racist, or thoroughly immoral. 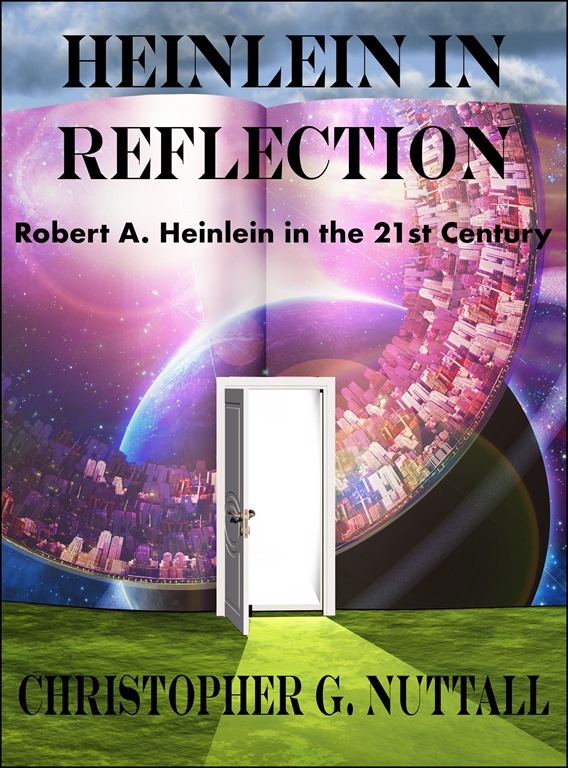 Is Heinlein still a great mind? Or should he be forgotten like so many other writers of his time? First, the treatment seems to be progressing ok. I’ve got another scan later this afternoon that will – in two weeks or so – tell me if I need more treatments or if they can shift to simply monitoring me, post-treatment. I’ve had some aches and pains and a handful of minor colds that won’t go away, but I’m hopeful. I’ve managed to get back into the swing of writing and I don’t want to stop <grin>. Second, I’ve finished the first draft of Cry Wolf (TEC 15). I’m hoping to get it edited by Friday/Saturday and get it uploaded to Amazon and various other places shortly afterwards. 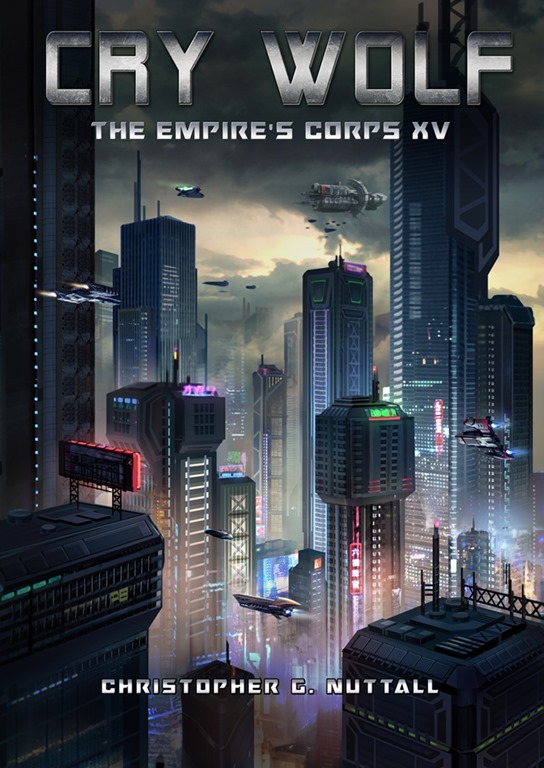 I’ve been told it’s a little different from the other TEC books – it’s a side story, setting the groundwork for the return of the marines – but I think it works. Third, my current plan is to start writing Cursed next week. That’s the direct sequel to The Broken Throne (SIM 16). I’m hoping it will go relatively smoothly, but I will probably have to slow down because it’s my son’s half-term and we have family coming. Fourth, my rough future plan is Cursed, The Right of the Line (Ark 14), Debt of War (Kat Falcone). I’m not sure what comes after them. Zero 6? Or A Learning Experience 6? This is a bit of a meandering post, written in hopes of easing myself back into writing, but bear with me a little. It may surprise some of my readers to know that I am both religious and profoundly suspicious of organised religion. A religion may come from God, if you believe in it, but the people who set themselves up as religious leaders are as human as you and I – and, therefore, bound by human nature. A religion that becomes a de facto theocracy falls prey to the same flaws in human nature that doom both fascism and communism, from the urge to impose one’s values by force to the inevitable rise of a dictator, put in power and maintained by the security forces (i.e. the religious police) that were necessary to impose the religion in the first place. The Theocrats of Iran – and even the Taliban – may have meant well, once upon a time, but they were corrupted by human nature. Religion provides all the justification one could possibly want to throw all restraint out of the window. Indeed, religion – and I include fascism, communism and social justice as well as Judaism, Christianity and Islam – adds a dangerous aspect to the problem. If one truly believes in one’s religion, it can be hard to question both the religion and its priests. It feels wrong to question a religious figure, even when he doesn’t live up to his words. Thus, we have Catholics who find it hard to reconcile their faith in the Vatican with the ever-increasing number of priests who have been revealed as sexual predators and Muslims who find it impossible to openly acknowledge that their religion has been turned into a weapon and used against them. Those who do are often attacked – even murdered – by people who feel ‘my religion, right or wrong.’ The urge to censure someone for anti-religious sentiment – however deserved – can be overpowering. This is a problem on a number of levels. On one hand, put crudely, what is the value of religious devotion if it is demanded (or extracted by force)? A Catholic who gives up meat for Lent, or a Muslim who fasts for Ramadan, is making a religious statement … but does it count if they will face everything from ostracism to death if they don’t? If the religious police arrests men who don’t have beards or women who don’t cover their faces … are those people doing something because they want to do it for God or because they will be punished if they don’t? Why should they take it seriously? Why should they not cheat? Forced compliance does not breed acceptance, but resentment and hatred. And that hatred will be focused – on the other hand – on the religion itself. The Vatican’s failure to admit that it has a problem – and deal with it – has done untold harm to Christianity itself. Britain’s historic fear and loathing of foreign authorities (from the Vatican to the EU) may stem from the Pope’s interference and hypocrisy during the reigns of Henry II, Richard the Lionheart, John and Henry III. It’s easy to lose any claim to the moral high ground when you start putting the interests of organised religion ahead of the people the religion is supposed to serve. It should be no surprise that the most irreligious people are often those who fled strongly religious communities. My religious education was never very through. What little we were taught about Martin Luther and the Reformation was strongly slanted against Catholicism, although (to be fair) the Church of that era was deeply corrupt and tyrannical. The idea of indulgencies (in which the Church would forgive a sinner in exchange for a massive cash payment) seemed grossly unfair. I found it impossible to accept that a man could go to Confession, receive a very minor punishment and find forgiveness and acceptance. How could a priest possibly forgive, for example, someone who had trespassed against me? I later learnt – when I had less biased teachers – that it was a little more complicated than that, but it stuck in my mind. The Church had crossed a line when it had abrogated to itself the power to forgive. And yet, as odd as it seemed to me, there was a certain method in the madness. The people of the past accepted their religion as indisputable. They believed in their religion – in both God and His Church – to a degree utterly alien to most of us in the modern-day Western World. (Even King John called for a confessor when he lay dying.) The common folk believed that to sin was to be damned and to be damned meant going to Hell when they finally died. If a sin meant that someone was damned, why should they refrain from more sin? They were already damned. They had nothing to lose. By offering forgiveness, the Church convinced sinners that there was hope. They didn’t have to be damned. A spell in Purgatory might be bad, but at least it wouldn’t be Hell. A cynic might argue that this was very convenient for the Church. And it was. But it was also based on a profound understanding of human nature. The vast majority of people who feel guilty about something – anything – would be delighted to seek forgiveness, if there was a prospect of actually putting the sin behind them. Confession thus served the purpose of both forcing a sinner to own up to the sin and acknowledge that he’d done something wrong – even if it was just to a priest – and liberating a guilty man from his guilt. It might not lead to punishment – the guilty man’s guilt would remain unknown to society at large – but it might keep him from sinning again. There are people who will argue that this is unsatisfactory, that the guilty man is avoiding punishment (at least in this world). And I would agree with them. But it is – at least in theory – a way to avoid a sinner throwing away all chance of redemption and going wild. By offering a way to face up to the sin, without actually being punished out of all proportion to the crime, it offers hope. And people will crawl over broken glass, if necessary, if there is a hope of getting what they want at the far side. We like the rules to be understood. We like the goalposts to be firmly emplaced. When they’re moved … watch out. I compared fascism, communism and social justice to religion for a reason. All three of them have a great deal in common with religion and – I suspect – speak to the same flaws in human nature that cause religions to go bad. Their devotees face the same problem as history’s theocrats; the vast majority of the population does not want to perform even lip service to the religion, so the devotees either have to abandon their ideals or force the vast majority of the population to conform. They therefore have to build a secret police – as I noted above – or give up. One would consider giving up to be the sensible option, but a person who treats his religion as an article of faith – i.e. without questioning it – is often unable to make the mental leap he needs to realise that not pushing it would probably make people think better of him. (There would probably be less opposition to gay marriage if pro-gay marriage people weren’t so intent on smashing all resistance.) Instead, he tends to assume that his religion is good and right and therefore anyone who disagrees with him is wrong and evil. Worse, perhaps, he is so convinced of the rightness of his judgement that he finds it impossible to accept that a dissenter might not be wilfully wrong. To him, the truth is so self-evident that no one could possibly disagree with him. There is no room for contradictory opinions. And he does not know when to stop. Humans do not like to be nagged constantly, even when the nagger has their best interests at heart. There comes a time, fairly quickly, when the amount of nagging required to get someone’s sullen compliance simply skyrockets, if that person is obliged to listen to the nagger. It does not matter, from our point of view, if the nagger is a religious nut or a social justice bully. The more nagging, the more resentment; the more resentment, the greater the chance of an explosion; the greater the chance of an explosion, the greater the chance that everything the nagger wants will be thoroughly (and perhaps unfairly) discredited. Now, say what you like about the Ten Commandants, but they are relatively easy to understand and follow. There was no doubt about what sort of behaviour crosses the line into sinfulness. When they were taught in schools, no one had any excuse for not knowing the difference between good and bad. The problem with social justice, however, is three-fold; the rules keep changing, the rules can be applied retroactively … and, worst of all, there is no system for forgiveness and social reintegration. A few weeks ago, for example, Kevin Hart (who I had literally never heard of before articles condemning him started popping up in my Facebook feed) stepped down as Oscar Host, after a number of homophobic tweets were discovered and savagely condemned. He currently seems to be wavering between stepping back up again and staying down, between grovelling for forgiveness and being defiant. His tweets were offensive and I quite understand why people were offended, but … what now? One of the problems facing society, these days, is that an apology is seen as a sign of weakness (and, in business, an admission of liability). But another problem is that there is no clear path to understanding, forgiveness and a return to society. (One might also question the value of punishing Hart when Hollywood holds far greater sinners, as we have been learning since 2016.) Should Hart be driven out of society? Or should a handful of tweets be held over his head for the rest of his life? There are people who will answer yes to both questions, for all sorts of reasons, but is this a good idea? It is a basic understanding that the punishment should fit the crime. If Hart’s career is utterly destroyed, there will be people – including Hart himself – who will argue that Hart was unfairly treated, that he was punished out of all proportion to the crime. One does not punish a naughty child by cutting off his head! If pushed too far, the outrage can rebound upon the mob; the people who do not share the outrage may feel that the mob has gone too far (even if they don’t agree with Hart’s tweets). The optics of bullying someone into submission – as people who supported the wrong football teams were bullied at school – are poor. But, more seriously, is there no statute of limitations on tweets? Or on … well, anything? People change, people grow up … at some point, the tweets you made when you were a teenager are going to shift from ‘daring and edgy’ to ‘stupid and idiotic.’ A person who had homophobic opinions as a teenager might grow out of it as an adult. Is it remotely fair for that adult to be condemned because of opinions he stated when he was a young man? And can anyone say, with complete certainty, that they never said anything that – perhaps taken out of context – could be used against them? The blunt truth is that society changes too. What was acceptable in 1970 is now utterly verboten. And that’s a part and parcel of social change. But … is it fair to blame someone for doing something that was, at the time, regarded as acceptable? The push to condemn TV shows like Friends and Seinfield has a great deal in common with the Taliban’s wanton destruction of Afghanistan’s history, but it is fundamentally stupid and pointless. Reasonable people understand that social mores change over time. Attacking TV shows that were made in a different era – and there are quite a few cringe-worthy episodes of Star Trek and Doctor Who – merely gives the attackers a bad name. And, perhaps the most important thing of all, why should someone strive for forgiveness if there is no forgiveness to be found? The funny thing is that the incident that started this line of thought had nothing whatsoever to do with Kevin Hart, but a set of controversial moments in the writing world that probably have no meaning to anyone outside the writing world <grin>. The first was Robert Silverberg’s public condemnation for his opinion of Nora Jemisin’s 2018 Hugo Award speech. The second was Gregory Benford being condemned for statements made at LOSCON. The third was Mystery Writers of America deciding that it would not honour Linda Fairstein’s writing for her role in the prosecution of the ‘Central Park Five’ (alternate take). Now, I’m not going to get into a pointless argument about if these people crossed the line or not (I had honestly never heard of Linda Fairstein either until I started seeing articles about her) or if they deserve punishment. By the time I heard about the controversies, there were pro- and anti- articles popping up all over the internet, with people putting their own slant on the affairs and then shouting down everyone who disagreed. There was a particularly nasty article on Silverberg – which I will not link – that basically painted him as a racist. You can go read them yourself if you like. The question these three incidents lead to, however, is simple. Is there any way back for them? The question is more treacherous than it seems. One opinion holds that Linda Fairstein was guilty of serious misconduct. Another holds that she did the right thing, based on what she knew at the time. A third accepts that she was in a tough position and could not afford to back down. I don’t know the truth and I probably never will. Should she be punished for making a bad call? To the best of my knowledge, there is no evidence to suggest that she was wilfully wrong. And should Mystery Writers of America have the right to punish her by withholding an award explicitly to punish her? I am aware, all too aware, of the satisfaction that comes from pointing at the guilty and shouting “UNCLEAN, UNCLEAN, UNCLEAN.” But a fundamentally emotion-driven reaction cannot be trusted. One must be able to formulate a convincing argument that appeals to people who do not share one’s faith – or preconceptions. If Silverberg is to be condemned, it must be proven that he did something wrong. A case must be made that the punishment is just. And while one person can argue that he made graceless remarks about Nora Jemisin, another can argue that he had every right to state his opinions (but no right to expect everyone else to agree with him). YMMV. And yet, what are we going to do about this habit of regarding a single mistake as career-ending? If we are incapable of forgiving people who transgress against social norms that change from day to day, what does that say about us as a society? If we are unable to let someone get over it, to leave it in the past, why should we expect mercy when we have shown none? And if we are insistent on punishing the guilty out of all proportion to their crime, why should they repent and apologise? I cringe every time I read an apology statement because they sound like a confession extracted during a communist show trial. This breeds cynicism. Did [offender] really mean it when he apologised? Or was he only apologising because he wanted to avoid punishment? Does [big corporation] really care about [social issue] or is it doing nothing more than virtue signalling? Does [presidential candidate] really care about [social group] or is he just saying what he thinks they want to hear? And is that [writer/singer/actor] getting praised because they deserve it or because [reviewer] is scared to criticize? The hell of it is that a great deal can be lost. Most social reformers have good intentions – and they often have a point. But they can push too hard, too fast, and lose the goodwill and support of the population. And this can discredit their entire cause. Activists who go too far can cause a backlash directed against their community, even if most of the community wasn’t involved (in the way that PETA embarrasses animal rights activists). And – like I said above – societies change. What is acceptable today might be forbidden tomorrow. And societies that are unable to reintegrate the losers – however defined – are often setting themselves up for another round of civil war. All things considered, it’s been a bit of a frustrating month. Basically, I had the fifth cycle of chemotherapy in the first week of December – and it turned into a nightmare, as I was completely useless for the following week. I followed that inglorious moment with a all-new infection, which sent me back to hospital for a couple of nights (and then some more days spent coughing) just in time for the sixth (and hopefully the last) chemotherapy treatment. Which led to another round of chemo brain, which I really could have done without. So Cry Wolf and Cursed (and everything else on my schedule) have been delayed. I’m sorry about the problem, but right now it can’t be helped. On the plus side, both Para Bellum and The Alchemist’s Apprentice are now available in paperback. (Let me know how they look – this is the first time I’ve worked directly with Kindle Paperback instead of CreateSpace.) Audio versions of these two – and The Broken Throne – are on the way, but – as usual – I don’t have a due date yet. I’ve also started diversifying my publisher base through Draft2Digital. Everything in Kindle Unlimited is, of course, exclusive to Amazon, but I’m hoping to put everything else on a number of different platforms. If you use them, please feel free to let me know what you think. Right now, you can download most of the Ark Royal and Zero books through the various platforms. I hope you all had a good new year – and I hope to bring you many more books when my head finally clears up.